Your home is your haven — where you live, love and relax. 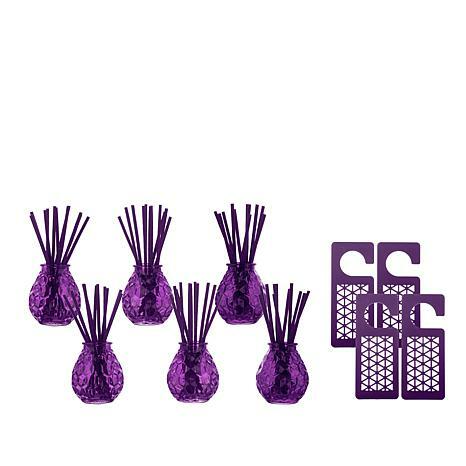 Make it even cozier with this decorative home fragrance set. Three vases with a diamond cut glass design come with Forever Fragrant sticks to give you up to two years of odor-eliminating scent. Also included are four Hang-Its to offer the same benefits in an easy over-the-door version. Choose from an assortment of shades and colors and come home to a more Joyful experience. Two excel!ent scents! I love JM Hang Its. I just wish she'd sell them separately and/or with sticks. I can do without the glass vases everytime. I now have 18 vases; they are cute, but what to do with them? One week after paying the $50 price, they went on sale & I got some more. Please Joy, consider selling just the Hang Its and FF sticks. The sticks with this combo are thicker than in other combos which is nice too. Love the scent and so many pieces for the price!!! Highly recommend scent sticks to everyone!!! This is my 3rd set of these Odor eaters and freshen my apartment. These really work with people that smoke. I have non but try it with a person who smokes in his apartment and the smell was about gone in 3 days. The only problem I had with the Forever not being able to smell all the scents provided, to note the ones I like best, for the office. Thanks Joy for providing these, as I do not by cans of fresher any more. Absolutely amazing to eliminate any bad odors and leave very pleasant soft fragrance! I was skeptical about how performance but gave it try...then WOW! Truly amazed. I hate fishy smells after I cooked fish and I usually used expensive odor elminator spray all over my kitchen, dining room, living room and even bedrooms every time and each times. But since I set this sticks here and there, I dont need to do it and any odors are totally gone! I am very happy and buying more! Thank you Joy!! !